A 2016 Buddhist Global Relief grant enabled Oxfam Sudan to provide groundnut and sorghum seeds and hand tools to 510 farming households in seven villages in Belail Locality, South Darfur. The project also trained 150 farmers in water-harvesting practices. Oxfam Sudan reported that many farmers participating in the project faced climate-related difficulties, including a combination of some flooding during the rainy season and drought during the September period of crop maturity. Furthermore, land disputes at times resulted in threats of violence, and some farmers harvested crops prematurely to prevent the grazing animals of nomadic pastoralists from consuming the plants. Despite these challenges, Oxfam Sudan estimates that farmers produced enough sorghum and groundnuts to meet 60 to 70 percent of their families’ annual food requirements, on average, with surplus groundnuts to be sold at market, providing funds to be used for food, education, health care, clothing, and other needs. 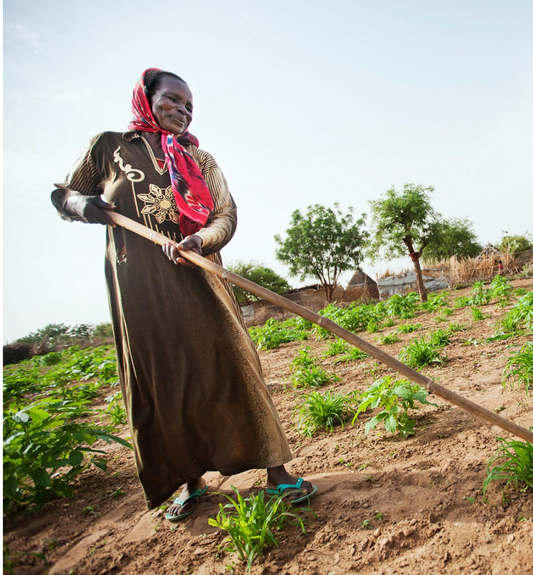 Among the displaced persons who received support through the Oxfam–BGR partnership was Sumaiya Adam Ahamed, a farmer in Eshma village in South Darfur. With her family she spent two years in a camp for internally displaced people (IDPs). “All people of my village [were] displaced to Kalma IDPs camp and stayed there for two years without farming, and our children missed two years of education, especially my elder daughter, Ishraga Hassan,” she told an Oxfam Sudan team member as she harvested groundnuts with two of her daughters. She wore her youngest child, an infant, in a cloth carrier as she worked. “My family was selected by the Oxfam team for support, and we were given groundnut and sorghum seeds in addition to two hand tools. This enabled us to cultivate one acre of groundnuts and one of sorghum.” She estimated that the crops would feed her family of seven for five months; she also supports her family by raising chickens and livestock. This entry was posted in Agriculture, Ending global poverty, Engaged Buddhism, Food security, Global Hunger, Projects & programs and tagged Engaged Buddhism, Global hunger, Oxfam, Sudan. Bookmark the permalink. We felt its important to share with you this report.